For any sales person, recruiter or business owner trying to grow, LinkedIn is a great platform to meet potential clients. 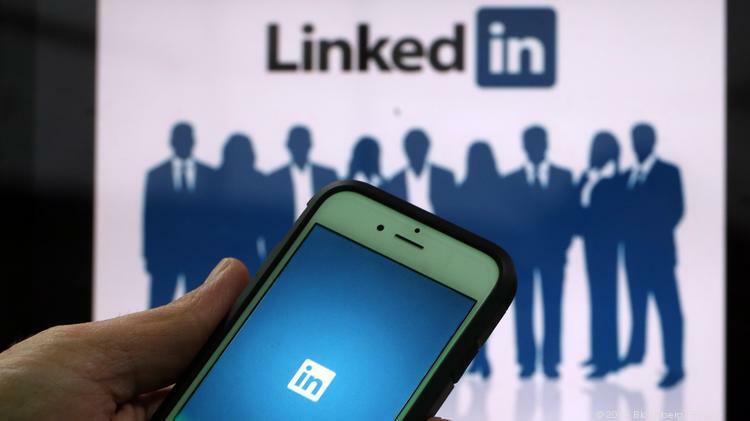 LinkedIn has the casual atmosphere of a social media platform combined with a concentration on building business relationships. The amount of advanced targeting you can do also really allows you to narrow in on the types of potential clients you want to connect with. If you want to grow your business, LinkedIn is great for getting leads and sales. The problem with LinkedIn however, is the constant barrage of people trying to sell you things through messenger. 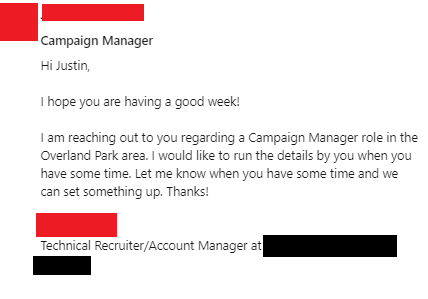 In my own experience I get messages from recruiters, sales coaches, digital marketers and every other service under the sun. I don’t mind receiving messages, I’ve even worked with people who first contacted me through messenger! 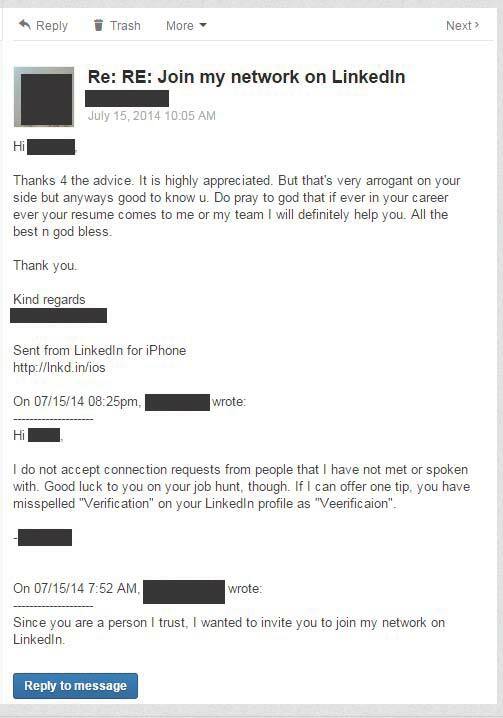 What people seem to forget is that there is a right way and a wrong way to go about LinkedIn introductions. 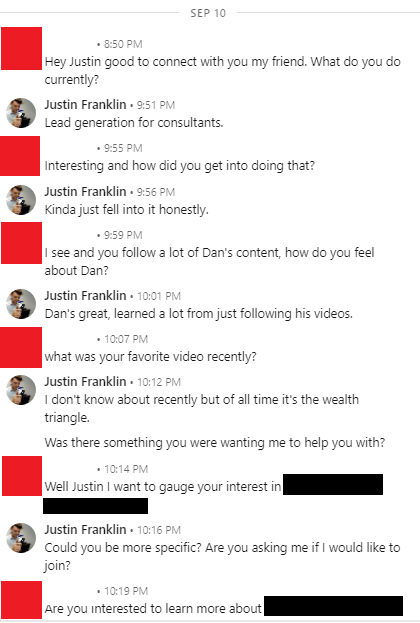 Here are a few examples of what not to do when connecting with people on LinkedIn. 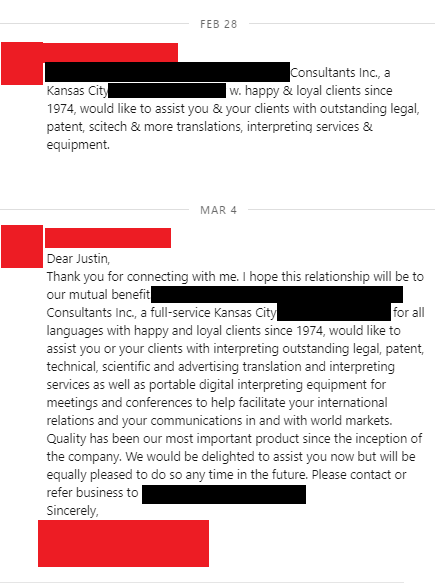 Do you only work with Kansas City based clients? If you do all languages how is your quality control? If you do legal, patent, technical etc. how specialized is your copy going to be? These are questions that are best brought up during a live conversation, not with a basic introduction. You don’t want to give your prospect an excuse to say “not interested” right off the bat. Try to limit your introductions to one paragraph at most. And please, use spacing! At least with the first message the person is focusing on what they do so you can find out what their offer is right away. With this message you are just wasting a lot of time trying to build rapport. Worse still, a lot of the questions this person asked are things they could get just taking 1 minute to look at my profile. Just get to the point when making an introduction. That way you are not wasting each others time. You can build rapport during the actual meeting over the phone or in person. Look, LinkedIn is not the place for casual text conversations. If you are looking to reach out to someone for a new job or to do business with be a bit more professional. That isn’t to say you can’t have a laid back or more casual conversation. But maybe leave the text messaging lingo at home. Think of it like a job interview.  You know you need to make sure your resume is up to date and free of spelling errors. Do the same thing for your LinkedIn messages. You most likely have very little credibility with this person so don’t become too familiar with your writing habits when reaching out to them. Another tip, if someone gives you constructive criticism, take the criticism without insulting them. You reached out to them, so why would you insult them by calling them “arrogant” after they tried to help you? You’re just burning more bridges that way. Short and sweet messages are the go to for LinkedIn. Be relevant, be to the point and have a call to action that makes sense. This message is awesome. It makes a light introduction, uses appropriate spacing and grammar and tells me the exact reason they are contacting me. It does all of this in just a couple of sentences so I am more likely to read the entire message. Too many people fall into the trap of over-complicating their messages. Too many people fail to check for spelling and grammar errors. Too many people make the message about themselves and not about what they can offer the person they are messaging. Focus on how you can provide the person your messaging value and how you can present that as efficiently as possible. This will help you get more out of LinkedIn and will make the overall platform better for following up with leads and sales. 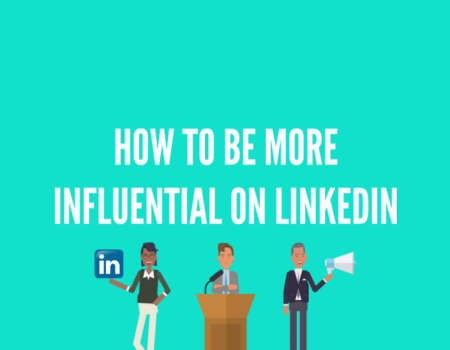 How to be more Influential on LinkedIn. 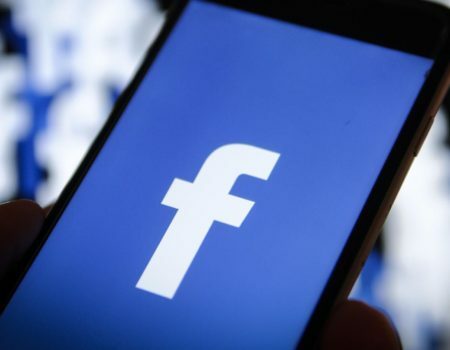 3 Facebook Advertising Strategies Your Small Business Should Implement. 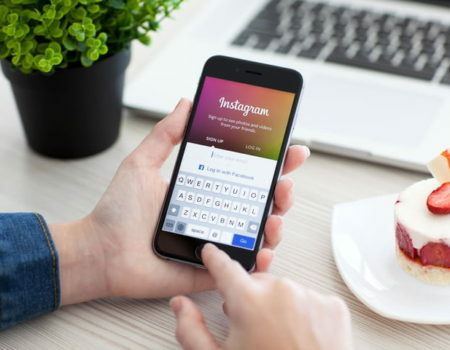 4 Tips to Improve and Grow Your Instagram Page.